legem dedisti vertice in maiestate gloriae. 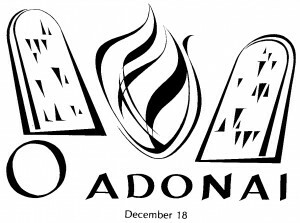 This Evening the Antiphon for the Magnificat is O Adonai… The term adonai is the word that the Jewish People called God, he was their adonai, Sacred Lord, Master of All, their Majesty. They so reverenced the name of God that one has to wonder why we do not any more? They were scared that if they mentioned the name of God they would use it unworthily, that they would be profaning his sacred name. And now when we go out of our homes we hear his name used for anything and everything, we hear that his last name is Da*nit, We hear his son’s name used when someone scares someone, when someone slams their finger in the door “JESUS CHRIST!” or just Christ. At what point did we begin to have such disregard for the Lord’s name? Let us take today as a chance to go back to our respect of his name, let us join with our Jewish brethren in exclaiming O Majesty! O Sacred Lord! O Master of All! O Adonai! The Church remembers today: the giving of the law to Moses, the law that we are born with written on our hearts, and the power of God to deliver us from slavery to Satan. Post by Dominican Sisters of Mary, Mother of the Eucharist.